This debtor is one of the four targets Mr. Straus will ask you to visit in Chapter 2. 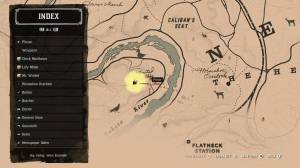 He’s located in a ranch up the hill west of Horseshoe Overlook. Head inside to trigger a cutscene. Once Wrobel is down on the floor, grab him and beat him up (but not too much!). Wrobel is a feeble man so you’ll only need to hit him once then threaten him. 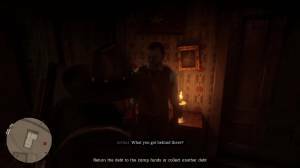 Arthur will let go and you’ll have the freedom to explore the house and take as much items as needed to match the amount he borrowed. 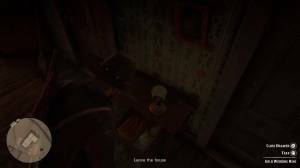 You should be able to collect the necessary amount by looting the items in various drawers and cabinets in the house. He’ll also be protecting a drawer that has his gold wedding ring. 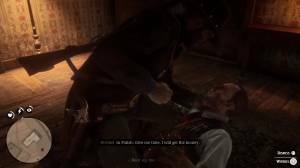 If you’re a truly evil outlaw, you can order him to move out of the way and loot it. Otherwise, you can just leave the man be with his last prized possession and head back to camp.